You know how September rolls around and everything magically becomes pumpkinpumpkinpumpkin? This used to excite me. A lot. I bought pumpkin soaps and candles and dreamed of pumpkin-y desserts. And then I realized something. You might want to brace yourself. Cover the eyes of any small children wandering through the room. Pumpkin is not my favorite. I do love Sara’s Pumpkin Crumble. And there was that time when my husband and I were newlyweds and I was working at Kneaders and I brought home a loaf of pumpkin bread (much like this one) and ate the whole thing and told my husband I gave it to the neighbors. And there are these Pumpkin Whoopie Pies (my argument about not loving pumpkin is becoming less and less convincing.) But I would probably (okay, definitely) say no to a slice of pumpkin pie. And all that pumpkin-scented stuff hasn’t appealed to me since I had morning sickness with my second and third offspring during October and November. I am decidedly, unabashedly, passionately in love with apples and pears. Those are my fall flavors. My love language, if you will. And ever since I was a little kid, if I had my pick of anything in a doughnut shop, it would either be a maple bar or an apple fritter. Except now, all the apple fritters I can find in central Louisiana are gross and that makes me sad, so of course, I have to make my own. and some Granny Smith apples. The recipe I got this from said 2, but the only Granny Smiths I could find at the store were tiny, so I did 2 1/2, which ended up being about 12 ounces of apples. 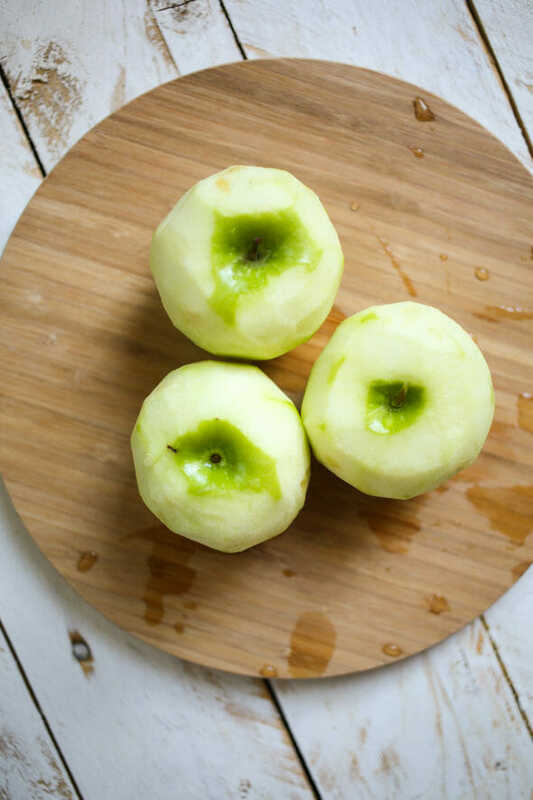 You’ll want to peel them, core them, and chop them into 1/4″ pieces, then spread the prepared apples in a single layer on paper towels and pat dry with paper towels. 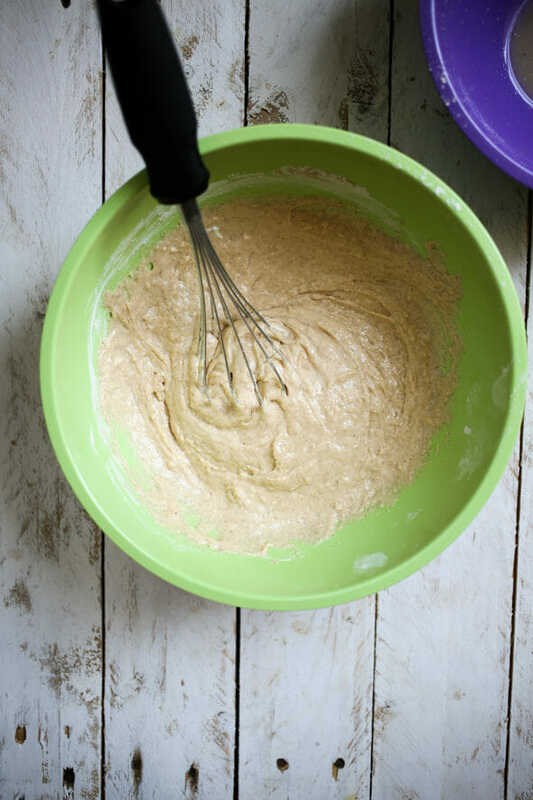 Combine the flour, sugar, baking powder, salt, cinnamon, and nutmeg in a large bowl. 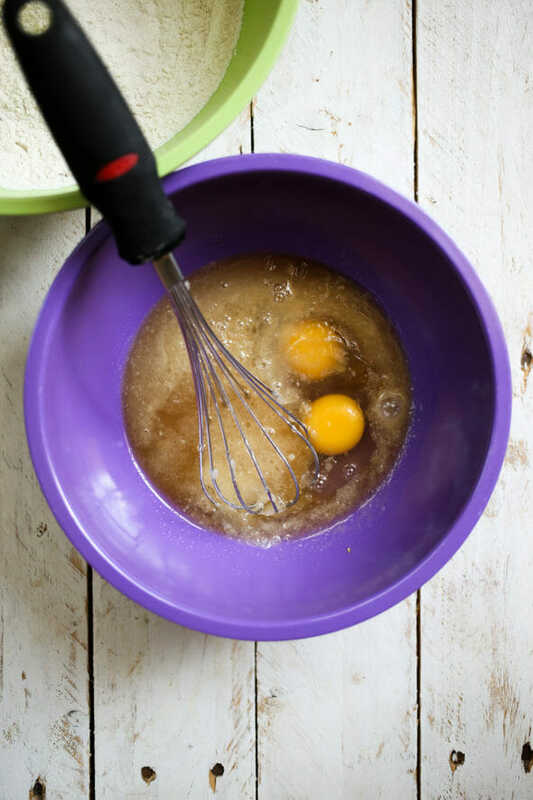 Whisk the cider, eggs, and melted butter in a medium bowl. Set a wire rack over a rimmed baking sheet. Heat the oil in a Dutch oven or other heavy pot over medium-high heat until it reaches 350 degrees (use a candy thermometer or an instant-read thermometer to check.) Use a 1/3 cup measuring cup to carefully drop batter into the oil, being careful not to crowd the pan (I can’t make more than 3 at a time.) Fry, adjusting the burner as necessary, to keep the oil between 325-350 degrees. Cook about 2-3 minutes per side or until golden brown. Carefully remove from the hot oil and allow to drain on the wire rack. 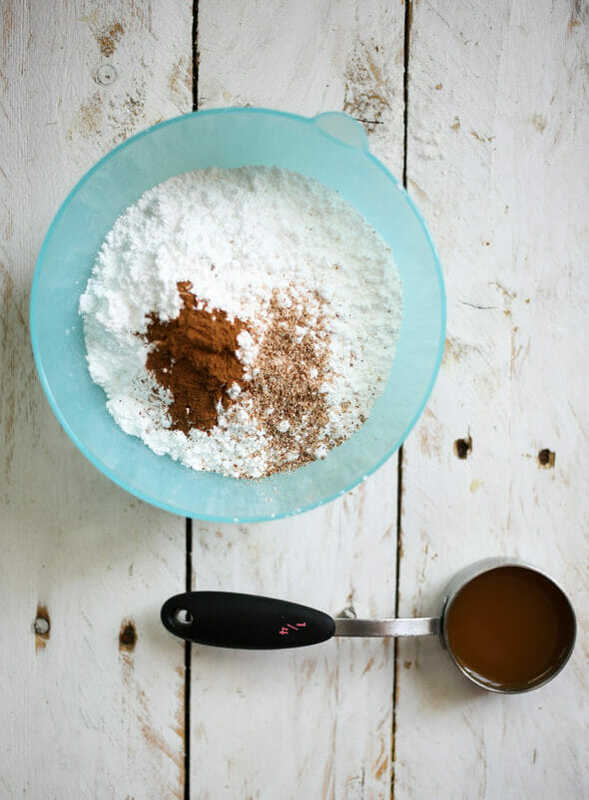 To make the glaze, you’ll need powdered sugar, apple cider, cinnamon, and nutmeg. When the fritters have cooled for 5 minutes, dip the top half of each fritter into the glaze and return to the cooling rack. Let the glaze set for 10 minutes. 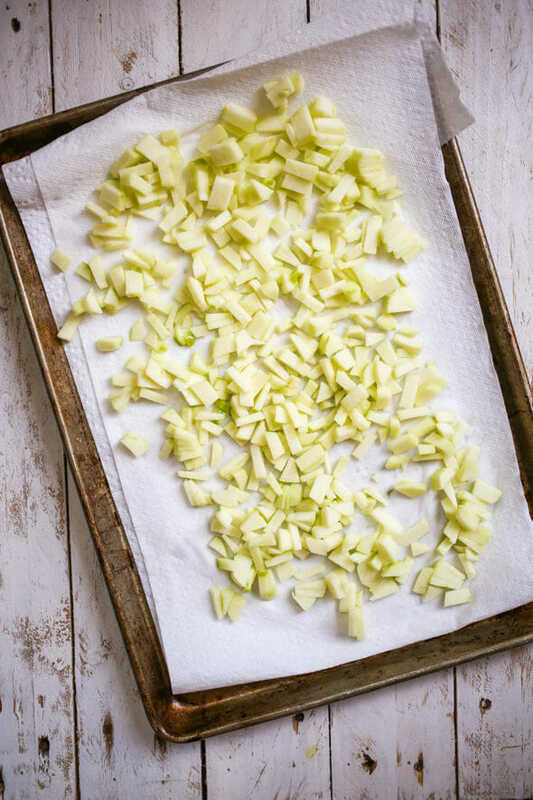 To make the fritters, spread the prepared apples in a single layer on paper towels and pat dry with paper towels. 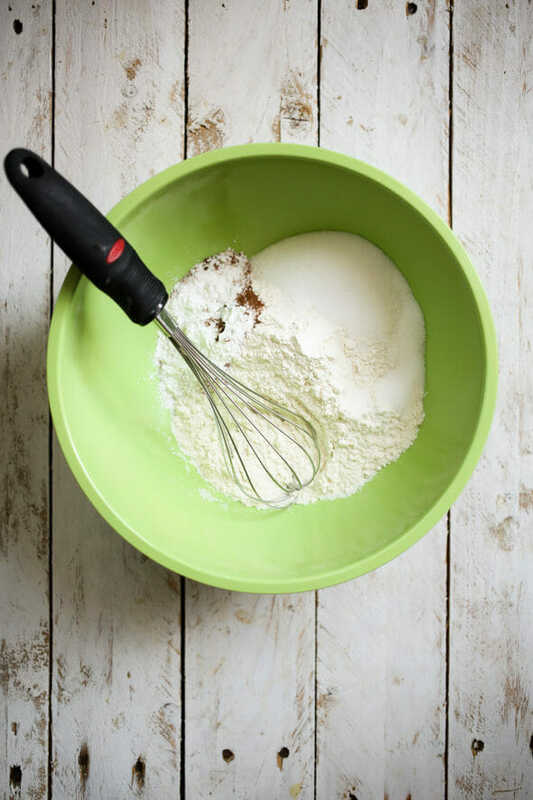 Combine the flour, sugar, baking powder, salt, cinnamon, and nutmeg in a large bowl. 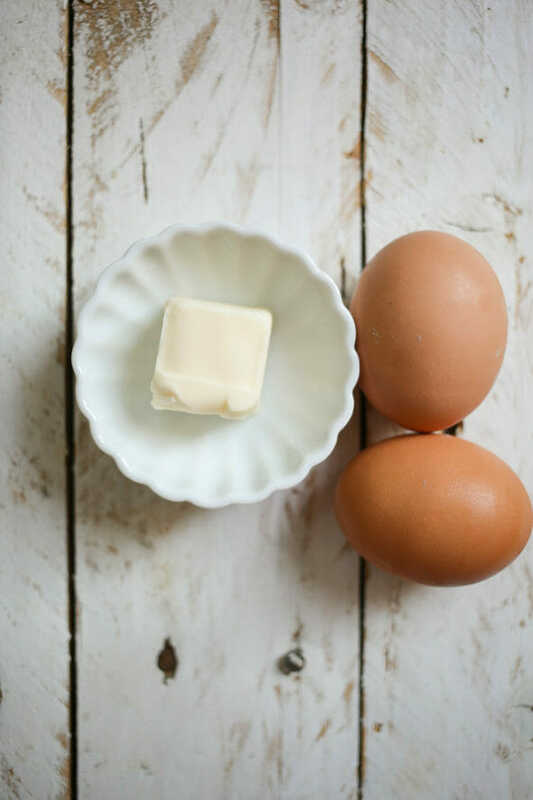 Whisk the cider, eggs, and melted butter in a medium bowl. 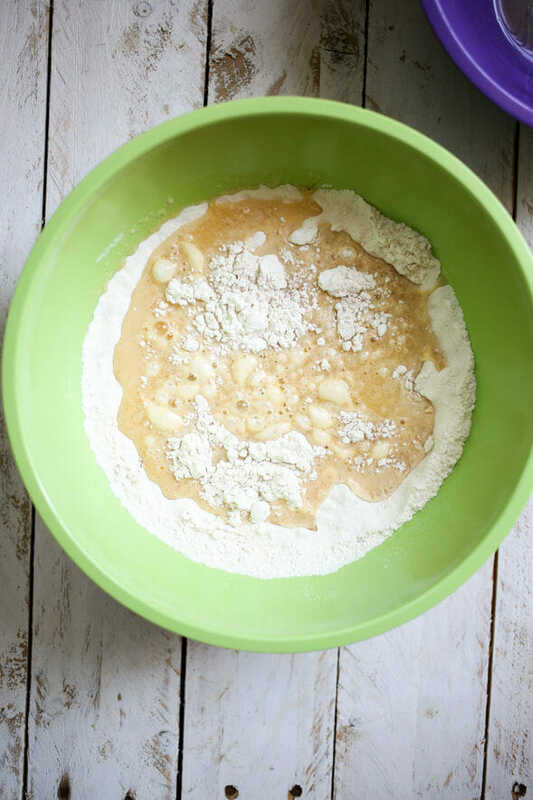 Stir the apples into the flour mixture and stir in the wet ingredients until incorporated. 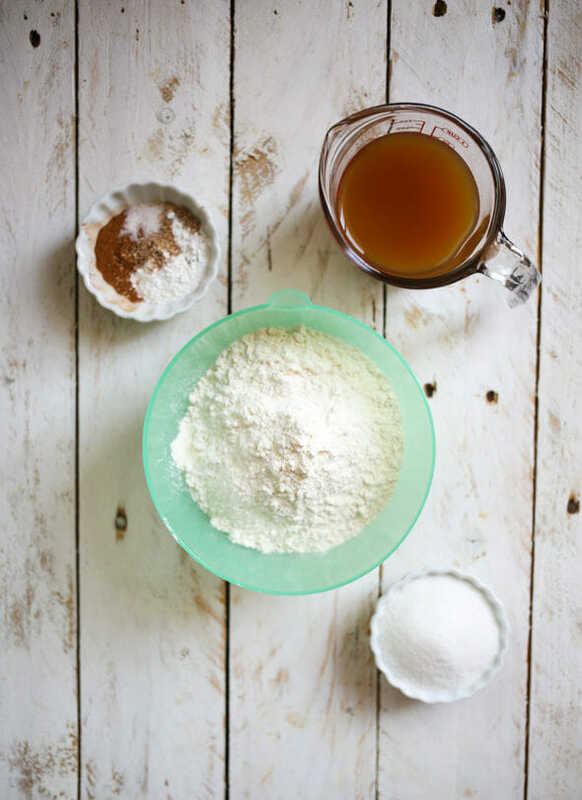 To make the glaze, whisk together the powdered sugar, apple cider, cinnamon, and nutmeg. When the fritters have cooled for 5 minutes, dip the top half of each fritter into the glaze and return to the cooling rack. Let the glaze set for 10 minutes. *When we say apple cider, we mean the dark, murky stuff sold in gallon jugs in the fall, not the alcoholic beverage or the light, clear apple juice that is sometimes called cider. If you can’t find fresh cider, Simply Apple is a good substitute and available year-round. So happy to see I am not the only person alive who doesn’t like pumpkin!!! 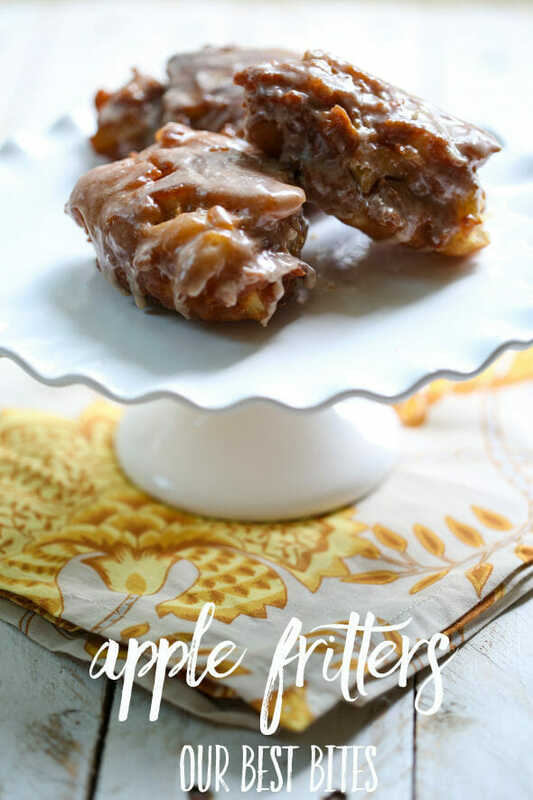 And my husband will be thrilled to see that I can start making him apple fritters! I had never even tried them till I married him and now I love them too. Maple bars and apple fritters- yes, yes, yes! How lovely to see a Fall recipe that isn’t pumpkin! More, please! Here in Australia pumpkin is not a Thing; it’s a year-round staple vegetable. It doesn’t come in cans either, which makes trying out pumpkin-based recipes really tedious. Thanks for posting something different. I fell very validated to know that someone with a cooking blog shares my feelings toward pumpkin! I just never have been able to understand the obsession! If it’s eggnog flavored, I am all over it, but I also LOVE apples and apple fritters. Thanks for a delicious and easy looking recipe! I love pumpkin, but I also love to laugh and that’s always what Kate is good for. I mean doesn’t everybody dream of fall pastries and wearing fat pants. I’m on some crazy health challenge where I only get sugar once a week and I daydream of what I’ll eat on my sugar day everyday. If I can have some self-control with these Apple Fritters maybe I can avoid the fat pants that day. I’m not a big pumpkin fan either. I like pumpkin loaf (in fact I just made one and keep sneaking crumbs from the end piece!) but that’s about it. Love all things apple though! These look sensational! Since most of my dreams center around really great apples (and lead to fat pants), I’ll definitely be making these this weekend! Hooray! Always been an apple girl and fritters are my fav. Thank you!!! So excited to try this. Must have been inspired! Love all the talent! Thanks for sharing so many wonderful recipes. Can’t wait to try the apple fritters. Quick question – if we are overseas and the only thing remotely resembling cider that we can get is plain clear apple juice, can we use it or will it not work? Do I need to make any adjustments? Apple fritters are my FAVORITE donut!! I only discovered them 4 years ago, but now it’s hard to order anything else when I go to a donut shop. There’s a little place near my house that makes the BEST fritters ever, if we ever move away from hear I’ll have to try your recipe. For now I’m just glad I don’t live in Louisiana and can drive 10 minutes down the road and order a little piece of heaven! Question: Could I use coconut oil to fry these bad boys? Yes and no…if you want to deep fry with coconut oil, it needs to be the refined coconut oil, not the virgin coconut oil that’s so good for you. That’s because the smoke point for the virgin coconut oil is much lower, so once you get the oil hot enough to fry, it’s going to start smoking. Good to know! Thanks! And the peanut oil doesn’t taste peanut-y right? I used to love pumpkin, and then after my second pregnancy my tastes completely changed! I still like pumpkin chocolate chip cookies, but other than that I’m not a huge fan anymore. 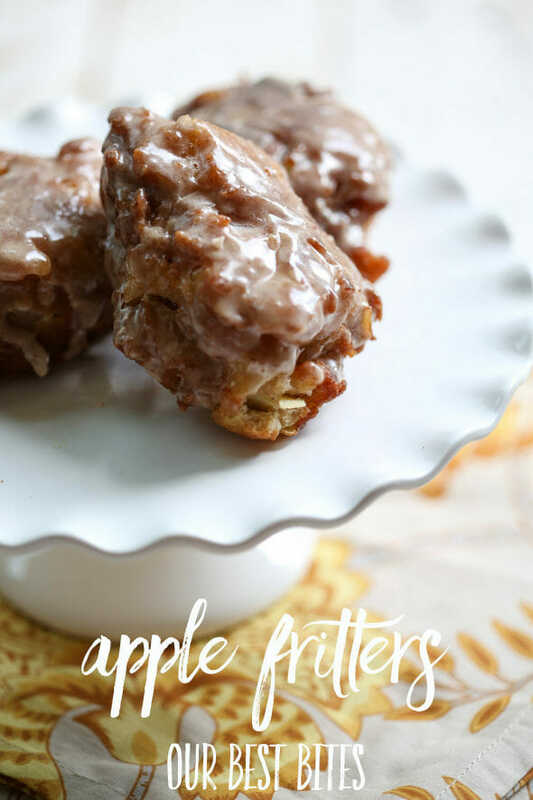 These apple fritters look divine!! Canola oil okay to fry these in or should I buy the peanut oil? Going to try making these for conference this weekend! Thank you! I forgot to even look for peanut oil at the store last night, so canola it was. Thankfully there was no fishy smells going on! I am a fan of your recipes, and tried making these yesterday (which may have been a bad life decision). They were a huge hit! Thanks for the great recipe! They were so much better than others I had tried. Oh, yay!! I’m so glad!! I’m here for you in all your bad life decisions, haha. CONGRATULATIONS on winning DietBet!!! Thanks so much for your sweet words!! I’ve been wanting to make these since the day you posted the recipe, and I finally had a chance this morning. They did not disappoint! I love apple fritters also, and these were so much better than any I’ve ever purchased. I had a little trouble getting my oil temp just right (even though I was using a thermometer), but I just kept making adjustments and everything turned out fine. I used Haralson apples and apple cider from a local orchard. I used about a tablespoon less of the cider and added in that much of King Arthur’s boiled apple cider to up the apple flavor even more. Delicious! I’ve been wanting to make these since the day you posted the recipe, and I finally had a chance this morning. They did not disappoint! I love apple fritters also, and these were so much better than any I’ve ever purchased. I had a little trouble getting the oil temp right (even though I was using a thermometer), but I just kept making adjustments and it all worked out fine. I used Haralson apples and cider from a local orchard. I used about a tablespoon less of the cider and added in the same amount of King Arthur’s boiled apple cider to up the apple flavor even more. Delicious! I just made these and followed the recipe exactly… DELICIOUS! I used a large cast iron pan and, even though I didn’t have a thermometer, I obviously chose the right temperature because every single one came out beautifully. I love the contrast between the slightly crispy outside and the softer inside, as well as the sweetness and tartness of the apple chunks. Thank you for posting this recipe and providing clear instructions that even I (a novice in the kitchen) was able to follow with a successful result! Oh holy night, these are AMAZING! Thank you, Kate!